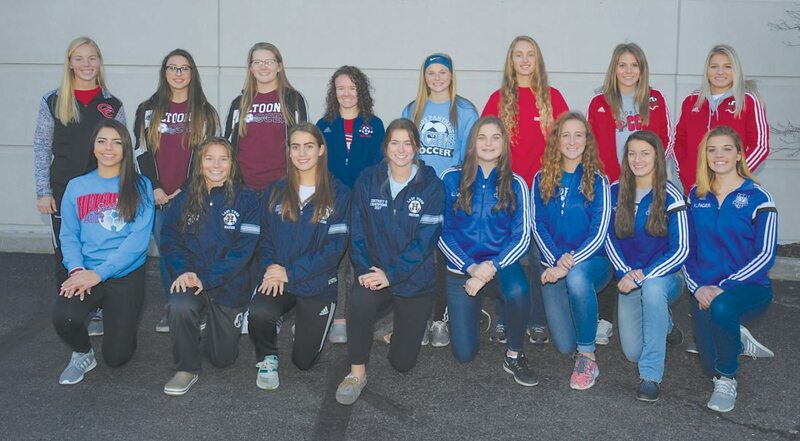 Mirror photo by Gary M. Baranec Altoona Mirror 2017 girls soccer first-team all-stars include (from left): First row—Cambria Heights’ Kelly Bassett, Hollidaysburg’s Mandy Sky, McKenna Hurd and Sydney Routch, Bedford’s Lindsay Mowry, Emily Martz, Amber Thomas and Alyssa Klinger. Second row—Central Cambria’s Mary Beth Woods, Altoona’s Ashlynn Irwin and Jen Worley, Huntingdon’s Jordan Hawkins, Penn Cambria’s Emmy Harvey, Everett’s Kaitlyn Maxwell, Central’s Meghan Flaugh and Ashley Negley. Absent for photo were Central’s Kirsten Laird and Northern Bedford’s Sadie McConnell.